Y’all. I’m so pumped! I know I’ve mentioned a few times that we were going to be tackling our kitchen and then I left you hanging. I’m so sorry! We have been dragging our booties with this project, which is technically a ton of smaller projects wrapped into one giant project. I’m actually glad it’s been taking forever because I have changed my mind about fifty million times on what I want to do. But now I feel like I really have a crystal clear vision for what I want the space to become and I am over the moon excited about bringing that vision to life! What better way to get my booty in gear than to sign on to the fall 2015 One Room Challenge! The goal is to make over a room in six weeks, checking in each week with progress updates. I feel like a crazy person for wanting to make over a room, let alone the KITCHEN in just six weeks, but I am diving in head first and I am going to make it happen. I’ve already got the hubby on board, so IT’S ON! Let’s check out what we’re dealing with first. All of these photos are from the MLS listing before we moved in (so don’t judge!). I’ve actually started working on the room (shh! don’t tell) and I don’t want to spoil the surprise just yet. Tada! What do you think? We’ve already painted the walls a warm greige color. Other than that (and the lack of very rustic country decor) it looks pretty much the same. The living room has been updated and is no longer harvest gold. Are you digging the orange cabinets? 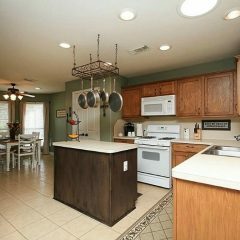 How about the lovely laminate counter/backsplash combo? Ok, I think that about does it. I may add a few things here and there, if time permits. Of course I will be styling it with fun (and practical) items, but these are my main points of focus. I am praying that we get it all completed because, honestly, after writing that all out, I am freaking out a little. I don’t have much of a choice though, because Thanksgiving is inching closer and closer, and a non-functioning kitchen during the holidays just ain’t gonna happen. Eeek! Alrighty. I better get going because, as you can see, I have a ton of work to do and not a moment to spare! I’ll check in next week to update you on our kitchen makeover progress. Check out our weekly progress! You’ve got this girl! What fun would it be if it wasn’t totally and completely overwhelming?! 😉 Can’t wait to follow along! Haha! I like your attitude, Kristi! I think it’s still going to be tons of fun. I am so excited to see your finished master bedroom! I absolutely adore your style. Oh I love following ORC kitchens!! You totally have this in the bag and I’m super excite to follow along! Thank you, Christine! I appreciate your confidence. 🙂 It will be fun to see how much we can complete in time! I’m getting ready to complete a kitchen reno myself soon. Luckily I have time to gather more ideas, because as I’m sure you know, it’s pretty overwhelming, and exciting all at the same time! Your plan sounds wonderful, and I can’t wait to see it complete!! Thank you, Iris! I keep second guessing myself as to whether this was a good idea but I think in the end it will turn out great. Just have to make good use of my time! Wow, you are ambitious, I like it! Your kitchen has good bones so It will be so fun to see what you do the next 6 weeks! Looks like it’s going to be a fabulous space when you are done! Thank you, Angela! I’m super fortunate that we don’t have a complete gut job on our hands. That would be insane! I’m excited to see what we can do with the space, though! Dang girl, that’s gonna look phenomenal, can you com make over my kitchen when you’re done? 😉 Can’t wait to follow along! Haha! Thanks, Cat! We’ll see if I can actually pull this off first, LOL. 😉 That would be loads of fun, though! That is s long list, but you can totally do it! I’ll be following along. LOL! The more I look at the list the longer it seems! Thanks you so much, Hollie!